cabinetroom | History, Reviews, Archives. Original 1946 poster for “The Murderers Are Among Us”. Source: Author’s own collection, photographed in the Deutsches Historisches Museum. “The Murderers Are Among Us”, or in the original “Die Mörder Sind Unter Uns”, is the arresting title of the very first German film to be made after the Second World War. It was a work that confronted head-on the country’s recent Nazi past, depicting some characters struggling to come to terms with wartime trauma and others managing to escape retribution for the terrible crimes they had committed. All was set against the horrifying backdrop of Berlin’s actual postwar ruins (a fact that meant “The Murderers” became known as the first Trümmerfilm or “rubble film”, a genre focussed on the physical and other devastation Nazism had caused). 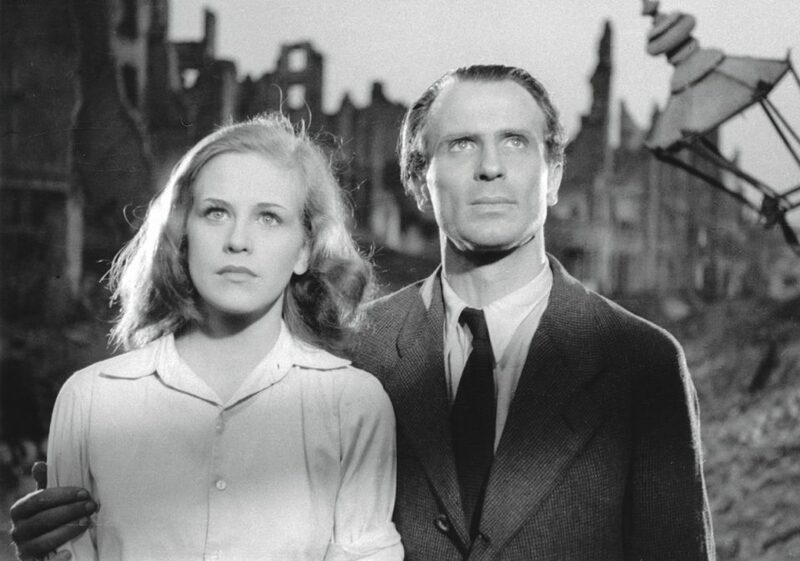 Actors Hildegard Knef and Ernst Wilhelm Borchers stand together in front of the actual rubble of a destroyed Berlin. Knef’s character came to symbolise the Trümmerfrauen, or “Rubble Women”, who endured against the odds in order to rebuild their own lives and the city. Source: http://wolfguenterthiel.blogspot.com. At the start of production in early 1946, the subject matter of “The Murderers” was deeply controversial, so much so that Germany’s occupying American, British and French powers actually refused the director, Wolfgang Staudte, permission to proceed. Although all three powers were carrying out their own denazification programmes at the time, they feared that a movie like “The Murderers” might lead to unwelcome grassroots vigilantism. Wolfgang Staudte, 1906-1984, director of “The Murderers Are Among Us”. Source: IMDB. Only the Soviets could see value in the film’s emphatic message about identifying and denouncing ex-Nazis wherever they might be. Thus, Staudte ended up making his feature for DEFA, the studio that would go on to become East Germany’s monopolistic state-owned production house. Even the Russians demanded a change to the plot so that the principal villain, a former Nazi responsible for a major atrocity in Poland in 1942, was handed over to the authorities to be punished rather than being shot by a former subordinate. By making “The Murderers” for DEFA, Staudte helped the fledgling East German state to steal a significant march on its western rival when it came to cinematography—there would be no West German film to equal Staudte’s feature for several years. Ultimately, Staudte himself ended up defecting to West Germany in 1955, but, even there, he continued to protest against the many important Nazis who had quietly escaped justice, disappearing into respectable, affluent lives and leaving their victims without justice. You can read more about “The Murderers Are Among Us” and Wolfgang Staudte in Stephen Brockmann, A Critical History of German Film, pp.197-210.